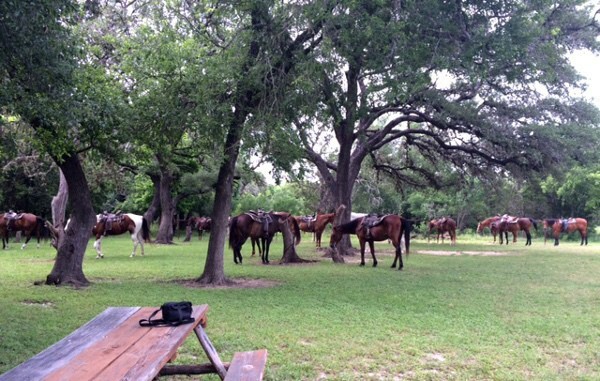 Home»All»Kid Friendly Texas Vacation: Mayan Dude Ranch in Bandera! 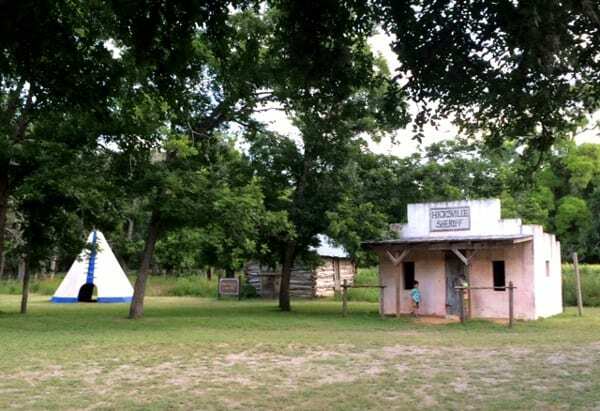 Kid Friendly Texas Vacation: Mayan Dude Ranch in Bandera! 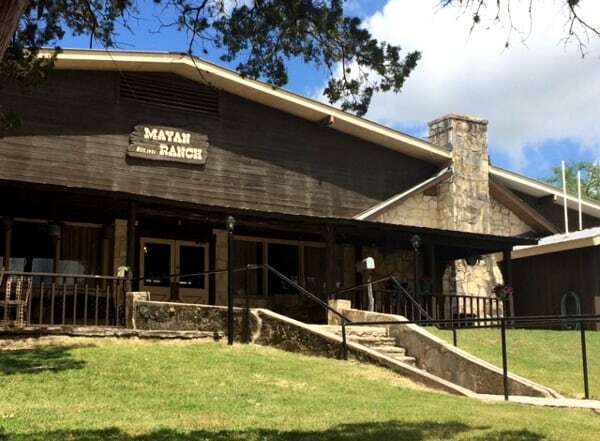 If you are looking for a kid-friendly vacation in Texas, we have a great place for you: Mayan Dude Ranch in Bandera, Texas. Get those cowboy boots, shirts and jeans out of the closet and head to the “Cowboy Capital of the World”, aka Bandera just 47 miles north-west of San Antonio. The Mayan Dude Ranch has been around for a long, long time. My husband used to go when he was a kid. So when my in-laws wanted to have a family reunion this summer, they chose this wonderful place. The ranch is run by the same family, the Hicks and everyone working there makes you feel like you are part of their family too! As you drive to the ranch among beautiful hills and horses, you will start feeling like everything is taken care of for you. You can choose between cute cabins throughout the property or a two-story lodge (where we actually stayed). The décor is simple and rustic but the rooms offer all the comfort you need. 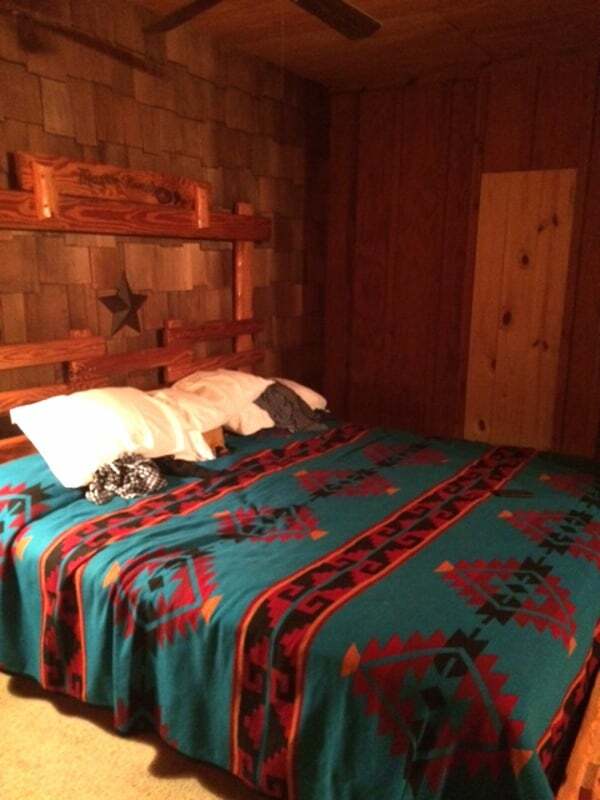 We chose a double attached room that had a king size bed and two double beds, two full bathrooms and a lot of storage. But you will soon realize that you won’t be spending much time there! At check-in, we picked up the schedule of the day and my son was excited by everything! Mornings and afternoons, they offer horse rides at the corral. Their horses are very friendly and the cowboys know which horse is right for you. My husband and my son took advantage of every ride by the river or in the hills. 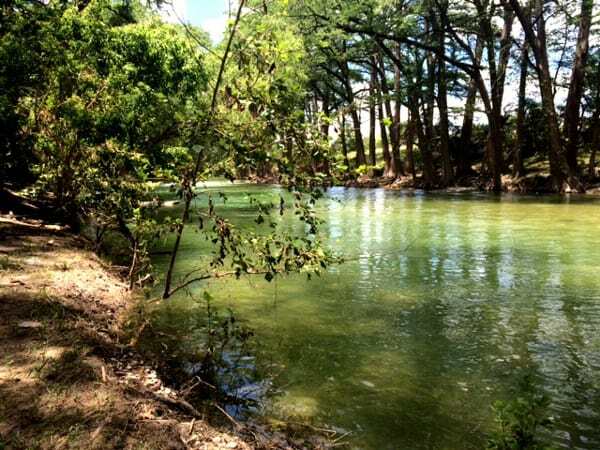 A short walk from the corral, there is the Medina river which benefited from all the rain we received this spring. 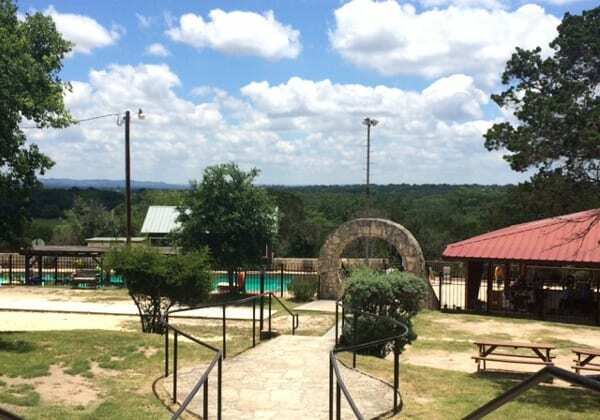 It is so beautiful down there: the water is crystal clear, you can relax and float down on inner tubes, watch the small fish… If the water is too cold for you, head back to the main ranch and relax by the pool, or play ping-pong or just relax in the playroom. Another quick walk away and you have Hicksville: a great clearing with a teepee, a playground and little houses children can explore. They even have a young kid club in the morning so parents can have time for themselves. 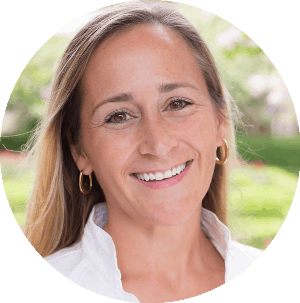 As a mom, I am going to tell you the best thing for me: all the meals are planned, cooked and served for you! I loved not having to think about groceries for a few days! In the morning, we opted for the cowboy’s breakfast: you can ride a horse there or take a hayride to a nice clearing in the woods. They have picnic tables and eggs, bacon, potatoes, biscuits, gravy, coffee, orange juice… There is even a nice man at the guitar for entertainment. What better way to start your day?? If you want to stay in bed later, they have breakfast in the dining room. 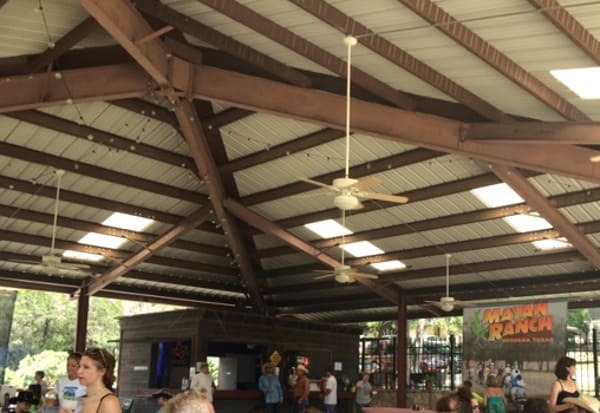 Lunch and dinner are buffet style in the main pavilion, a huge outdoor space with a roof. They have so many options, that everybody is bound to find something delicious! We had a crowd ranging in age from 3-year-old to …much older and we all enjoyed every meal! They had great salads, hamburgers, homemade bread…. And at about 5.45pm, they had snacks: my son’s favorite moment because it was a complete surprise! Of the many activities they organize for you, we loved the Cowboy Olympics where we all competed. It was the first time for me and my son to learn how to lasso! They had a talent show, a dance and an animal show during our 3-night stay! By 9 o’clock, the ranch would wind down and we all had a very, very good night of sleep! 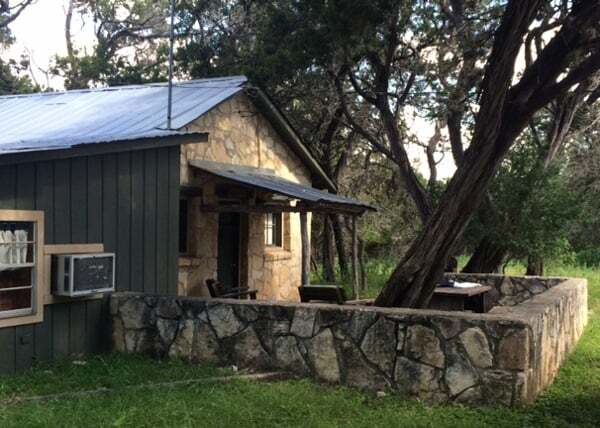 I enjoyed meeting the Hicks family throughout the ranch and meeting the other guests, we all felt relaxed and we barely noticed that there is only WiFi in the main office! Actually, my son soon forgot about Minecraft but discovered his love of horses and ping-pong! We spent great quality time together, walked a lot and made wonderful memories. So if you want to enjoy a unique break from the routine not too far from Houston, head to the Mayan Dude Ranch in Bandera. The Hicks family will welcome you with open arms! For more Texas roadtrips, go HERE! Is Local Food Important to You? Don't just shop "Texas Grown", shop "HOUSTON Grown" with Plant It Forward Farm Shares! Children will really enjoy in this place. They will learn a lot in so many activities here. 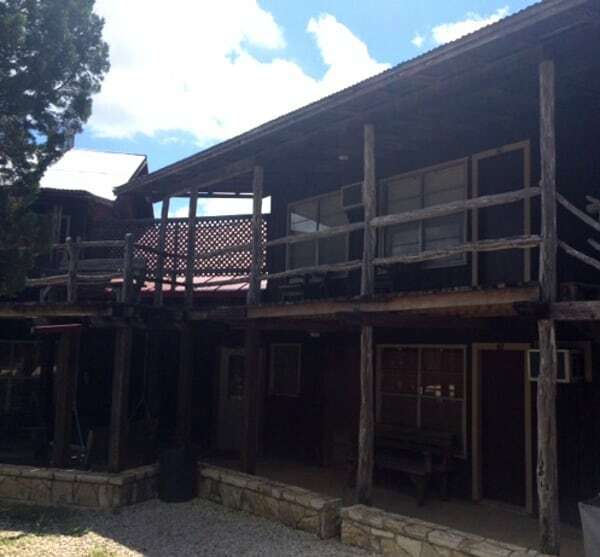 We will recommend this ranch in our friends so that they will also experience how fun to be here.